This is one of my favourite things! Eggs right from the chicken – all sizes and colours. I love nothing more than watching and listening to the chickens going about their business and enjoying their gifts. Everyone I know who has chickens is madly in love with them. 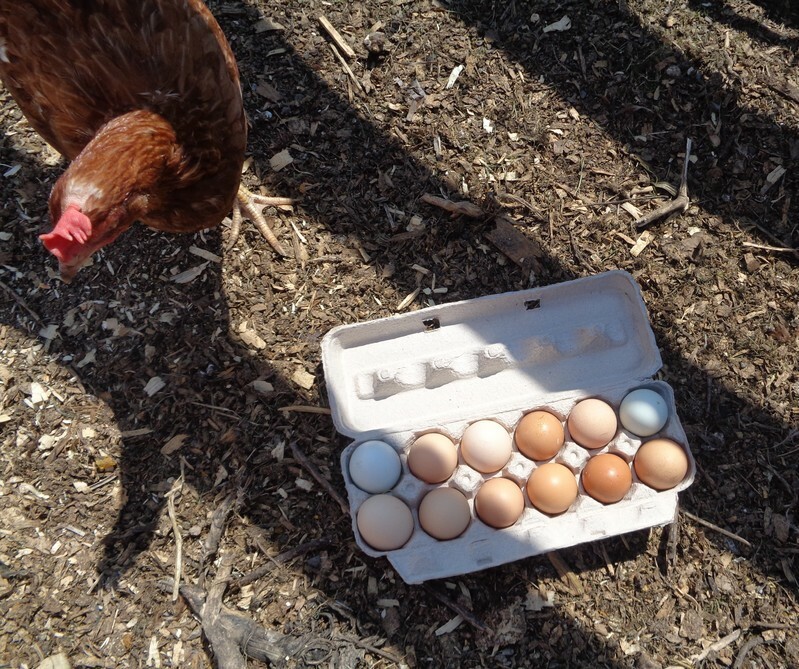 But I can hear her (the hen I mean) musing … hey, wait a minute, those are MINE!!! And they were. What a treat! Some were still warm, and all colours including blue. Love this — the “story,” the composition, the way your shadow crosses the hen’s. I’m a city girl, so I had no idea eggs came in so many colours. You learn something every day. Some of these eggs were still warm, taken right from under a hen. And the flavour, the orange yolk! So good. My first time seeing blue ones, though I’d heard of them. Different chicken varieties lay different colours. Was happy to find a new farm that sells fresh eggs weekly. Only a wee drive (fifteen minutes) and completely worth it.